After the previous 78 minute one track effort of the hard to get into ‘Step Into The Future’, world acclaimed guitar virtuoso George Bellas has seen fit to make things more accessible this time giving us 19 tracks for our 79 minutes of listening time. Obviously George is not short of material or inspiration, with the music proving that he is in the most inspired shape of his career as this is an absolute cracker from start to finish. That said as Bellas has handled everything on this album himself with the exception of drums coming from Marco Minnemann he proves he is also a master of bass and keyboards also. Seeing fit to deliver an album consisting of elements from across his career means forays into neo-classical tinted explorations as well as highly progressive skilled compositions gives us the best of both worlds for anyone with a passing interest in George’s career which began on Shrapnel Records in the mid 90’s. Not only has Bellas looked over his career but also strived to improve things sonically too and this album is a beautiful work of art not only in composition but also production. Shunning the current trend to overload an CD with volume ‘The Dawn Of Time’ is a god send for lovers of dynamics (even if it means you have to reach to turn your volume control/slider up) with Bellas virtually eschewing compressors for the albums creation. The album has a wonderful sense of space and breathes beautifully, to top it off Bellas tone has been captured so purely tone fanatics will be drooling over this. Highlights of the album come in almost every track from the simplistic (by Bellas standards) opener ‘Cyclone’ which will draw you in with its neo-classical feel, before the more progressive time signatures of ‘Seeding The Universe’ makes you wonder how George does it. The neo-classical edge comes back with the glorious ‘Let There Be Light’ which is home to an absolute scorcher of a solo with tone to die for, rich in harmonics yet not overloaded with gain, the sound really shows that its all in the fingers and Bellas makes the string moan, cry and scream big time here. The title track is home to advanced time signatures which Bellas manages to make sound easier than the average 4/4 before the stripped down almost easy approach of ‘Machine Man’ with its deep bass guitar sound (again tone to die for folks) and Hammond organ make a fine backdrop for Bellas to work his guitar magic over with some eastern tonalities and some Zeppelin style orchestrations. ‘Voyage To Triangulum’ is a slow minor blues progression allowing George to get all emotional on us and the result is pure beauty. ‘Mysterious Light’ is one of the most experimental tracks on the album being mostly orchestral with space age fx, before the Bach n roll of ‘Mystical Dream’ will please fans of Malmsteen/Uli Roth etc, again the solo section is pure aural ecstasy for lovers of guitar. ‘Glimmering Stardust’ is another absolute highlight building throughout its journey where again the bass guitar and drums of Marco Minnemann (Paul Gilbert) are a joy to behold building with piano flurries. The solo that begins at 2:09 is so emotionally charged it brought a lump to my throat such is the soul on offer here. This coupled with the lone guitar over soft chordal backings really showcases how well Bellas has captured his new found tone and again the result is nothing short of stunning. ‘Electromagnetic’ has an almost 70’s rock vibe ala Focus to it with its pulsating rhythm and Hammond organ, it’s an easy track to digest too and a nice fusion of styles. ‘Genesis Of Life’ harks back to the progressive territories explored on his ‘Planterary Alignment’ album with some nice synth work whilst ‘Carbon Creature’ is dark, with a fine sense of impending doom about it allowing Bellas to deliver some lush classical sounding melodies. The joyful light and air of ‘Suns Of Andromeda’ is a nice contrast to its predecessor and wouldn’t be out of place on an Uli Jon Roth album. Trumpet fanfares introduce ‘We Are Not Alone’ which has an Uli vibe about it also thanks to its beautifully worked vibrato and stunning note choice. ‘Nightmare Awoken’ is the heaviest track on offer in terms of rhythm guitar with a riff that sounds like vintage Malmsteen yet Yngwie would never be this bold when it comes to the lead guitar patterns which sees Bellas maintaining a neo-classical edge yet eschewing all the stock motifs made famous by Yngwie. ‘Primordial Atom’ is like Mozart on steroids and here Bellas is really smoking tempo wise in his lead work. ‘Metropolis’ then takes a radical change of direction being built around a groovy bass line which leads into a nice new sound that adds another string to Bellas’ armoury. The delicate major tonality and laid back tempo of ‘Always At My Side’ yields more fine melodies and a sense of calm before the progressive and heavily orchestrated closer ‘The Angels Are Calling’ sees the album out. I have written a lot about the music on offer on ‘The Dawn Of Time’ the music on offer is worthy of much more and its been a sheer delight listening to this album numerous times in run up to the review. 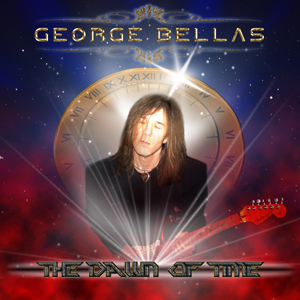 With ‘The Dawn Of Time’ George Bellas has delivered his magnum opus and this is a stunning all round release. Yes there is a lot to absorb, but there is also enough here to draw you in on first listen and from then you will be hooked. George Bellas has proven himself to be the guitar virtuoso of 2010 and despite living in a different time and playing in a different genre deserves to be remembered as we do now with the likes of Mozart, Bach, Lennon and McCartney. This is timeless music of undisputed quality making it definitive George Bellas. Hot Spots : Pretty much the whole damn thing. This entry was posted in Reviews and tagged Arts, George Bellas, Guitar, Marco Minnemann, Music, Paul Gilbert, Rising Force, Shopping, Yngwie Malmsteen. Bookmark the permalink.